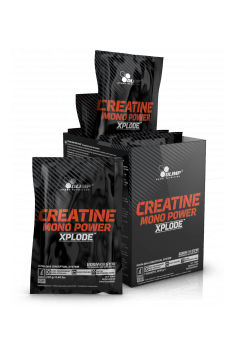 Olimp Creatine Mono is a groundbreaking dietary supplement containing ultra-micronized creatine monohydrate with the complex CREA Loading DB-6 System. The preparation is conducive to the improvement of growth and sports effects. CREA Loading DB-6 System is a formula, the aim of which is to protect the structure of creatine from the transformation to its inactive form and facilitate the absorption of creatine from the digestive system to the bloodstream and from the bloodstream to muscle cells (it doesn’t require using “transporters”). The ingredients contained in the preparation (vitamin D, vitamin B6, sodium dicarbonate, sodium citrate) have been selected in such a way as to maximally shorten the absorption time of an unchanged molecule to the target places and create optimal conditions for ATP synthesis, not only in the initial phase of training, but for its whole duration. Creatine chemically is β- methylguanidoacetic acid, i.e. an organic compound containing structural elements of guanidine and acetic acid. Creatine is naturally produced in the organism from methionine, glycine and arginine, which along with phosphate part contribute to creating phosphocreatine. 95-98% creatine is contained in muscle cells, mainly in the form of free creatine and creatine phosphate. Creatine is considered to be one of the best legal anabolic means used both by top World competitors of many sports disciplines and by people practicing sport only for pleasure. It is a compound with proven effectiveness, which stimulates the growth of strength and muscle tissue. Creatine was discovered as early as in 1832 by a French scholar Michel Eugène Chevreul. Its name comes from a Greek word kreas meaning meat, as it is the richest source of this compound. The year 1950 turned out to be groundbreaking in the studies on creatine. Since then, in the USA, the production of synthetic creatine has started, which at the same time contributed to the development of studies on its influence on effort abilities. The main task of creatine phosphate is providing energy to rebuild used ATP molecules, which constitute the basic source of energy during the contraction of working muscles. During performing very intensive training sessions, energy necessary for ATP resynthesis is obtained primarily from the simultaneous breakdown of phosphocreatine and anaerobic glycolysis. However, it is important that the resynthesis of ATP from phosphocreatine, in comparison to the pace of glycolysis, is decreased almost threefold. In relation to this, the concentration of creatine in muscle tissue in physically active people may be increased by means of the supplementation with monohydrate. Creatine has positive influence not only on muscle cells. This compound may contribute to the improvement of energy metabolism also on cellular level in the brain. It was also proven that creatine supports intellectual abilities, especially among elderly people. The supplementation of this compound may also decrease the risk of sarcopenia among elderly people, especially in combination with strength exercises. Creatine also exhibits antioxidant potential, thanks to which it protects the nervous system. It was proven that using creatine may contribute to reducing mental fatigue, improve verbal, long-lasting and spatial memory and decrease the risk of developing neurological disorders – including depression and bipolar disorder. Scientific studies also confirm the positive influence of creatine in case of patients with cardiovascular system diseases and ailments related to orthopedic and nerve-muscle injuries. Importantly – using creatine according to recommendations is safe for health and does not contribute to the disorders of anabolic change markers, the level of liver and muscle enzymes and changes in morphology and lipid profile of blood. Summing up, Olimp Creatine Mono is a dietary supplement addressed especially to physically active people. It is an ideal choice for sportsmen practicing strength, endurance and speed disciplines. The preparation will work best in trainings characterized with maximal level of intensity, short duration and repeatability, as it brings incredible effects in the form of help in increasing lean body mass and muscle strength as well as the increase of physical efficiency. 2 portions: 1 just before workout and 1 immeditialy after end of training. 1 portion (2,75g of powder - 1/2 of flat teaspoon) mix in 50ml of water. One portion in the morning on empty stomach. 1 portion (2,75g of powder - 1/2 of flat teaspoon) mix in 50ml of water. The best time to take creatine is after training. It was also proven that creatine supplementation after training contributes to more effective muscle mass growth than when it is used before training. It also turns out that a carbohydrate meal has positive influence on the effects of using creatine. Insulin spike influences the transport of the active substance to the cell, in relation to which, it is justified to take creatine with a protein-carbohydrate meal. Citric acid - acidity regulator, aroma; acesulfame K, sucralose - sweeteners; pigments: carmine (for fruit punch flavor), riboflavin, beta-carotene (for orange flavor), riboflavin (for lemon flavor), silicon dioxide - anti-caking agent.